This e-learning session – Reducing Violence in the Community: Emergency Department Datasharing – is an interactive resource to improve community safety through data sharing between the Accident and Emergency Departments and Community Safety Partnerships. The Department of Health has established a programme of work to support better information sharing. A key part of this programme is work to support frontline staff with tools to enable them to collect and share information effectively. This e-learning resource is a key tool designed to support better understanding of what information sharing is and how it can be used to support violence reduction. The Coalition Government made a commitment to make hospitals collect and share information with Community Safety Partnerships in order to reduce violence. This objective can be found in the Coalition Programme for Government, as well as in the Ending Gang and Serious Youth Violence Action Plan (2011) and the Alcohol Strategy (2012). This e-learning resource is designed to be useful for anyone with an interest in information sharing to tackle violence – especially people working in the NHS and Community Safety Partnerships. This means it could be useful for Accident and Emergency staff – from receptionists to consultants, CSP staff – from managers to analysts, Police and Crime Commissioners, Directors of Public Health, Staff in Clinical Commissioning Groups or Health Wellbeing Boards. If you already have an account with e-LfH, then you can enrol on to the Alcohol – Reducing Violence in the Community programme by logging in to the e-LfH Hub, selecting My Account > Enrolment and selecting the programme. You can then access the programme immediately in the My e-Learning section. The Alcohol – Reducing Violence in the Community programme is also available to NHS healthcare staff via the Electronic Staff Record (ESR). Accessing this e-Learning via ESR means that your completions will transfer with you throughout your NHS career. 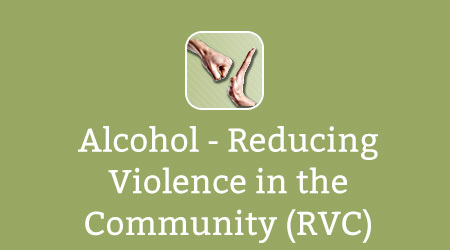 Non-NHS staff can access the Alcohol – Reducing Violence in the Community Programme via the Alcohol Learning Centre website: www.alcohollearningcentre.org.uk/eLearning/.